One of my favorite all-time television series is “Northern Exposure” which ran on CBS from 1990 to 1995 with a total of 110 episodes. It is peculiar that I didn’t discover the show until 1996, but that didn’t hamper my enthusiasm for what I judged to be one of the best written shows ever. The show was set in the fictional town of Cicely Alaska. Some say it was modeled after the Inside Passage town of Haines, Alaska while others claim that Talkeetna, Alaska provided the motivation for the town in the show. In any case, the show wasn’t filmed in Alaska at all. It was filmed on location in Roslyn, Washington. The show developed a cult-like following and I must admit that I’m a card carrying member. It is the reason why I’ve always wanted to visit Roslyn. Fourteen years after the last season, fans still attend the Moosefest festival in Roslyn each year. Now that’s staying power! For intangible reasons, the show led me to equate a small, rural town in the Pacific Northwest like the one depicted in the show with an openness to science. Why? In part, it is likely the nature of many of the main characters and their innate but understated intelligence. For instance, I loved the philosophical machinations of Chris Stevens (played by John Corbett), host of the “Chris in the Morning” radio show on the fictional KBHR station (pronounced “K-Bear”). Although not formally educated, Chris had time to engage in pure learning due to his time being incarcerated. I recall Chris on one particularly eloquent rant talking about the wave/particle duality of light. Then there was Maurice Minnifield (played by Barry Corbin), the Mercury program astronaut character. Several other characters carried their own intellectual weight such as Maggie O’Connell (played by Janine Turner) the bush pilot, Dr. Joel Fleischman (played by Rob Morrow) the New York doctor from Columbia University, Ruth-Anne Miller (played by Pet Phillips) the general store owner, and in his own way, Ed Chigliak (played by Darren Burrows) the native Alaskan film aficionado. All the characters had their own charm and memorable characteristics. Another reason I connect the show with scientific research is due to the climate. I’ve always thought of doing research in cold, snowy environs like Alaska. There’s something about sitting around a raging fire late at night, pondering the secrets of the cosmos. I guess I could see myself playing a role in that kind of community. I’m sure people in a small town like that would liken me to a mad scientist, the astrophysicist that stay’s up late at night doing who-knows-what. 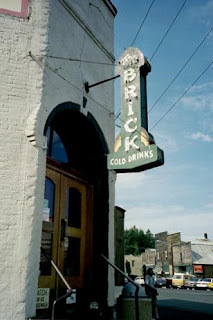 I could see myself hanging out at the local tavern (known as “The Brick” in the show, see the attached photo) and trying to educate the local folks in the ways of physics, astronomy, and mathematics as I was chowing down on a moose burger.